A machine pistol and ammunition were found in a parked car at a property in Boyle O’Reilly Terrace. 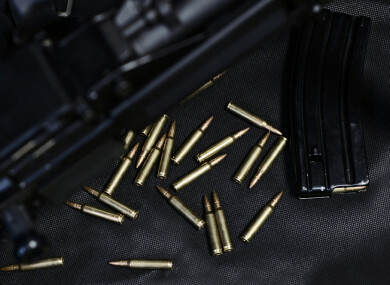 A WOMAN IN her 30s is due in court tomorrow morning charged in connection with the discovery of a machine pistol and ammunition earlier this week. A man and a woman were arrested on Wednesday after a car was stopped in the Crushrod Avenue area of Drogheda. The driver of the car, a woman in her 30s, was found to be in possession of a large amount of prescription tablets and arrested. A follow on search was then carried out at a property in Boyle O’Reilly Terrace, Drogheda and a machine pistol and ammunition were found in a parked car at the property. As part of follow up searches a man in his late 40s was arrested in Dundalk at around 9pm on Wednesday night. He has since been released without charge and a file is being prepared for the Director of Public Prosecutions. Gardai were carrying out searches as part of an operation targeting dissident republican activity in the Drogheda.The woman in her 30s is scheduled to appear before the Criminal Courts of Justice at 10am tomorrow charged in connection with the seizure. Email “Woman due in court after machine pistol and ammunition found in car”. Feedback on “Woman due in court after machine pistol and ammunition found in car”.